Straight Out Scribes has a wealth of material spanning 27 years. For the most current updates, like Straight Out Scribes on Facebook. Add us on Instagram. Also check out the SOS Blog and add your two cents. AVAILABLE NOW on Amazon, Kindle, BarnesAndNoble.com and other online platforms. Get your copy today! 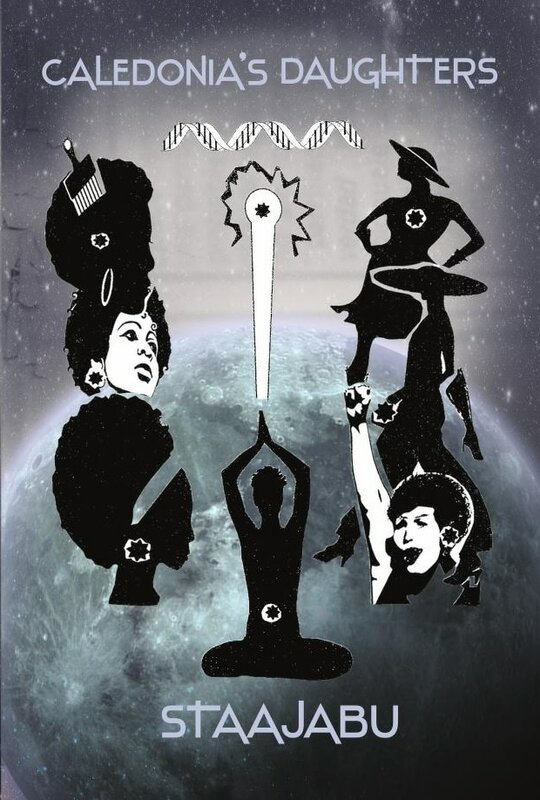 Caledonia's Daughters, an anthology of short-short stories with an afro-futuristic, sci-fi theme written by Staajabu. Straight Out Scribes will conduct a workshop discussing our unique poetry weaving technique as requested. Registration is required. $35 early bird ticket. Visit ourlifestories.org for more info. Thursday, May 9, Straight Out Scribes will feature at Luna's Café, 1414 16th St. 8 p.m. Plenty of Open Mic, so bring your own poems if you'd like to share. $2 cover or one drink minimum. Food and drink available. Space is limited. Meanwhile, stock up on Caledonia's Daughters, Mud Cloth Roots, Priorities and Scribes Rising. Remember, they also make great gifts for birthdays, other special occasions and the holidays. June 30, 2018 - FREE - Sacramento Poetry Center, SOS Family Art Show Legacy closing reception. 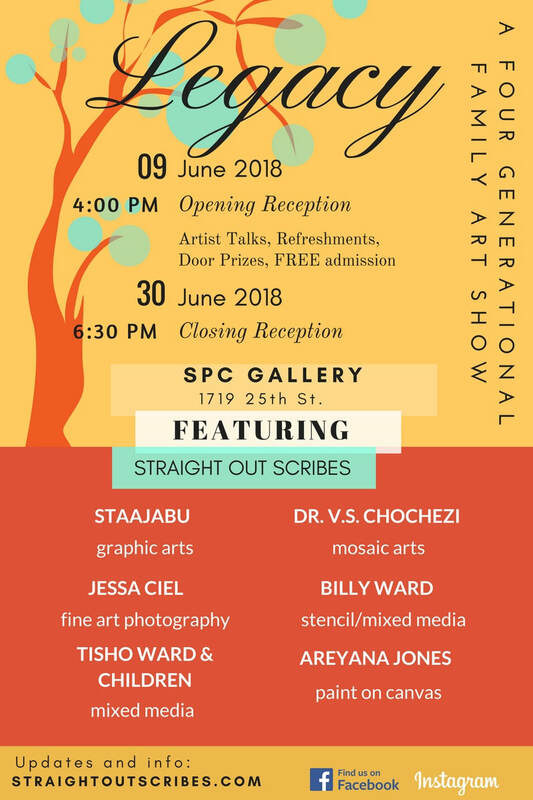 Saturday, 6/9 - FREE - Sacramento Poetry Center, Straight Out Scribes Family Art Show Legacy Exhibit Opening Reception, 4pm with art talks and performances with art from Jessa Ciel, Billy and Tisho Ward, Dr. V.S. Chochezi and Staajabu along with Areyana Jones. June 7 at noon on KUBU Access Sacramento Radio 96.5 fm the Scribes will talk about the family art show. Tune in! June 2, 6 p.m. at The Guild, SOS will feature. The Book Fair is jam packed with authors and activities so be sure to check out the schedule, but don't forget to join us at The Guild at 6. Saturday 5/19 - FREE Uptown Arts Fest at Roberts Family Development Center, Sacramento 5 p.m. to 8 p.m. Featuring Shawn Raiford Experience Band, with Straight Out Scribes serving as the MCs as well as sharing their dynamic poetry. Diva Market vendors will be on hand, along with door prizes and fun for the whole family. ​Thanksgiving Day, November 2017 tune into KUBU 96.5 Radiio, Access Sacramento for Straight Out Scribes guest appearance on "Sacramento Airs" with Charlene Jones from 4-5 p.m.
Saturday, March 11, 2017, 3-5 pm, at GOS Art Gallery, 1825 Del Paso Blvd. Suite 2, Sacramento. ​Wear your most cosmic, futuristic, science fiction, intergalactic outfit and accessories and join in the fun as mother/daughter poets Straight Out Scribes Dr. V.S. Chochezi and Staajabu embark on their newest venture, "Caledonia's Daughters", a unique work combining the art of poetry and short short stories about interplanetary Black women in the future. The Launch will feature a presentation by Simpson on the current art exhibited at the gallery. Editor Dr. V.S. Chochezi will speak on the publishing process and author, Staajabu will read from the book and talk about the historical participation of African American Science Fiction writers. There will be door prizes, refreshments, community announcements and books will be available to purchase and sign. Admission is absolutely FREE. Caledonia's Daughters is also available on Amazon.com including a Kindle edition for those of you who can't make it. Don't forget to Like us on Face Book @ Straight Out Scribes (SOS). Join Straight Out Scribes as we welcome Mama C back to Sacramento on her latest heal the community tour! Friday, February 24 BAPAC Sacramento Cannabis Education Forum! Located at the Capitol Event Center, 1020 11th St., Sacramento, CA 95814 (Between J & K Sts. ; park in parking garage at 10th & L; in alley next to Chops Restaurant). 916-750-0086.
www.bapacsac.org/registration or go to EventBrite.com to register. Join this "All Star" cast of panelists as we learn the difference between medical cannabis vs. recreational; various strains, THC/CBD levels, types of business in the cannabis industry (transportation, marketing, products, cultivation, graphic design, etc. ); discuss city, county and state ordinances, taxation, zoning, licensing and laws and regulations, Prop 64 and records expungement and more! Question & Answer session. Continental breakfast & lunch provided. Please RSVP. Don't get left out! It's being called the upcoming "Gold Rush" in California. GOS Art Gallery Studio, 1825 Del Paso Blvd. Sacramento. Mark your calendars and come hear what our seniors and elders have to say. All ages welcome, refreshments, door prizes, community announcements and fun galore. grandmomstaajabu@gmail.com - FREE – This is a Straight Out Scribes Production. Miss Marianna Please join us. Luna's Cafe, 1414 16th St.
Straight Out Scribes is releasing a new book of poetry in February 2015. The first booksigning will be at the Soap Salon Feb. 21 followed by a reading at 1001 Gallery. Stay tuned for the full schedule and press release. 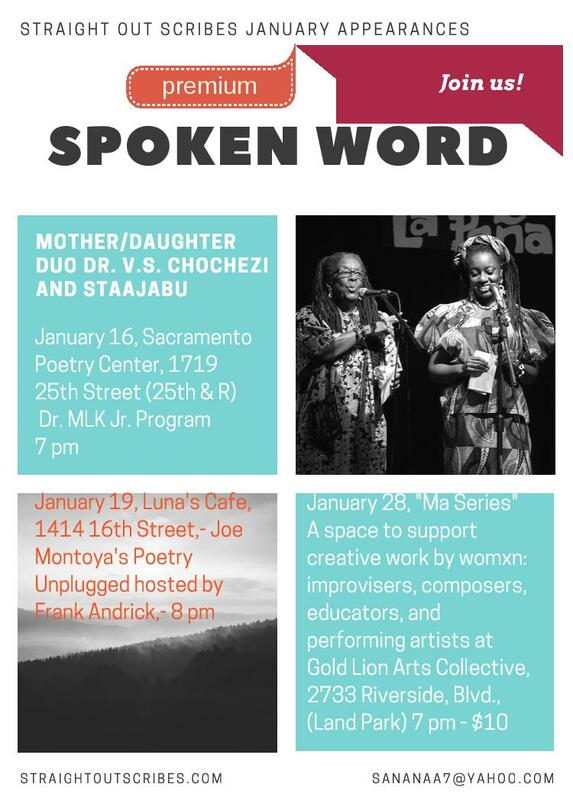 SACRAMENTO, Saturday, February 21, at 7 p.m., Straight Out Scribes, Sacramento’s dynamic mother/daughter poetry team Dr. V.S. Chochezi and Staajabu, unveiled their newest collection of original poetry, “Mud Cloth Roots”, at The Soap Salon, 3716 30th Street. “Sacramento is vibrant and rich in diversity” said Staajabu, matriarch of the team. “We think “Mud Cloth Roots” has a little something for everyone. Though there are some poems addressing serious issues, the book has a mostly upbeat, nostalgic, spiritual kind of vibe.” In addition to reading some of their poetry, the Scribes will tell you all about Mud Cloth, which is a beautifully decorated, handmade cloth from the African country of Mali. “Mud Cloth Roots” will usher in an exciting year for the Straight Out Scribes team. After the initial debut at the Soap Salon, they have scheduled four months of readings at different venues and locations, culminating with their Silver Anniversary celebration in May as a tribute to their 25th year collaborating as authors, publishers and performance poets. (See their schedule below.) For more information, contact Dr. VS Chochezi at sananaa7@yahoo.com.